It might be attractive to log into the first free public Wi-Fi hotspot that doesn’t require a password. According to the latest NBC report, security experts warn that those free Wi-Fi hotspots might actually be run by hackers to steal your personal information, passwords, credit card details and browser history. Expert said that dangerous free Wi-Fi hotspots are usually placed near world’s top tourist destinations. 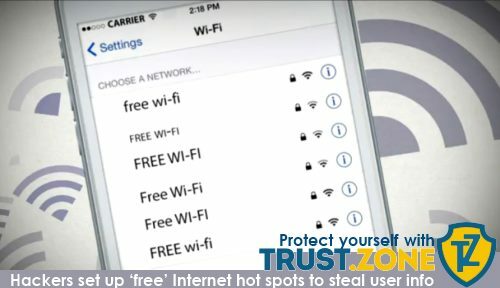 Expert recommends avoiding Wi-Fi hotspots with term FREE within the hotspot’s name. In addition, hackers are using SSL stripping to capture user information. SSL stripping is a method that allows hacker to downgrade HTTPS (secured URLs) to non-secure HTTP URLs. So, what’s are the best recommendation to stay safe while using free Wi-Fi hotspots? One of the best VPNs for browsing using any Wi-Fi network is Trust.Zone VPN. VPN routes your traffic through a secure network even on public Wi-Fi. It encrypts the traffic and creates a secure connection between you and the websites you are visiting. If you are at public place like hotel, airport or shopping center and using public Wi-Fi with Trust.Zone VPN, all of your traffic will be encrypted, so nobody using the same Wi-Fi will be able to read your data or any messages you sent. Trust.Zone VPN offers free and paid subscriptions, which start from 2.99 USD a month only. That’s one of the cheapest prices among all top VPN providers on the web.